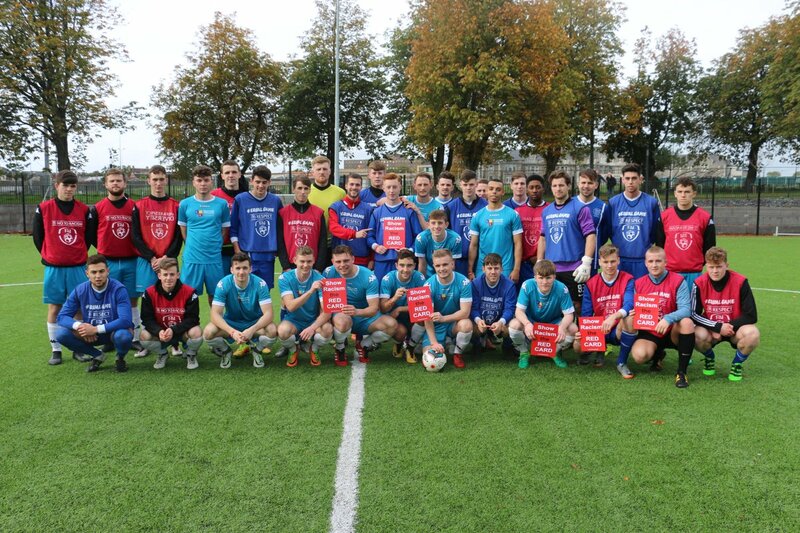 RUSTLERS Colleges and Universities Premier Division teams Dublin IT and Maynooth University, along with RUSTLERS Women's Premier Division teams IT Sligo and UCD held pre-match ceremonies this week to mark Football Against Racism in Europe (FARE) Week. Dublin IT and Maynooth University before their RUSTLERS CUFL Premier Division Game. During this week's events, all four teams embraced the message of anti-racism by wearing Anti-Racism bibs in their warm-ups. The players lined up in 'Champions League style and shook hands with players from the opposing team. As they passed, they exchanged wristbands from Show Racism the Red Card (SRTRC). In our club, there is no place for racism'. Dublin IT, IT Sligo, Maynooth University and UCD are among over 100 clubs, group, organisations - including schools, football clubs and community organisations - from throughout Ireland who are taking part in FARE Week 2017. The week is an initiative of the FARE network www.farenet.org supported by UEFA across Europe and is supported in Ireland by the Football Association of Ireland (FAI).The initiative runs from 5th to 19th October, and will see thousands of events taking place across Europe to highlight anti-racism messages and celebrate diversity. FARE Week 2017. Speaking about the FARE events in Dublin IT's Grangegorman campus and UCD's Belfield campus, FAI National Co-ordinator for Schools and Third Level Football Mark Scanlon said: "football can be powerful in uniting people and breaking down barriers. Now that Ireland is a multicultural society, we need to encourage children and adults to grow their understanding of the many new communities now represented amongst our neighbours, schools and workmates." According to Mark, "FARE Week is a great opportunity to use the power of football to bring people together, make a stand against discrimination and promote respect for diversity in football and in society. The events that are taking place during FARE Week serve not only to promote the anti-racism message, but also promote integration. We are delighted that four of our biggest Colleges and Universities and their numerous high-profile players embraced this message today and showed that racism has no place in football." Over the last 11 years, a huge number of clubs; schools, youth groups and others have taken time to support FARE Week in Ireland by organising a wide range of activities, including friendly matches, football blitz events and competitions. In 2017, we look forward to the ongoing support of the football and wider community to mark FARE fortnight. The FAI and Show Racism the Red Card would like to congratulate Dublin IT, IT Sligo, Maynooth University and UCD for becoming involved in FARE Week 2017."